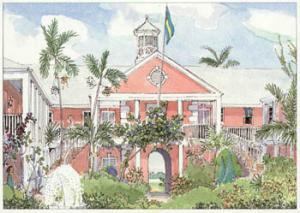 Cable Beach Manor in Nassau, on the north coast of New Providence, Bahamas, was built by the Count de Marigny from Mauritius in 1940. The Count used a colonial design well suited to the climate, with gable bents, jalousied doors, trellising and wide, shaded balconies. The Palladian staircase leads to covered walkways and the archway leads to the sandy beach. There are decorative keystones over the windows, quoined corners and a cupola on the roof. the ceilings are made of pecky cypress cedar wood and the original roof was made of cedar shingles. The pool lends cohesion to the newer wing. A selection of flowering plants and palms adds to the attractive setting and atmosphere.